The major Schools, for example, have approximately 5,000 members which enter the grounds split into various wings. They have between an 1h 05 minutes and 1h 20 minutes to show the best of their costumes, choreography, drumming and several other criteria. 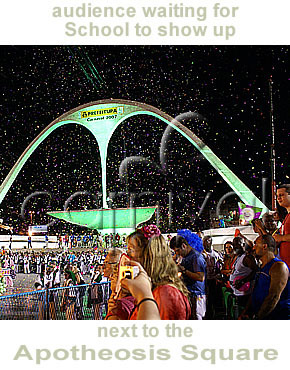 (If you want to know more about the criteria that rule the parades, check our Articles About Carnival, on the side menu). So it's always a great time to watch Schools parading, no matter where you are seated. However, you have to keep in mind that there is a time-lapse between the performance of one School and the next School to come. This time-lapse varies along the avenue. Parades start in front of SECTORS 2 and 3 and finish at the head of the avenue, next to the monument of the "Apotheosis Square". That's also in front of SECTORS 12 and 13. (Seating SECTORS will be explained soon in this text but for a quick glimpse you might check the parading diagram). As soon as a School leaves the grounds, the next School to parade enters the avenue, but it might be nearly an hour before this new School reaches the SECTORS at the head of the avenue, next to the Apotheosis Square. Despite of their long experience and the various rehearsals, it's not rare that even top Schools mismanage their parading times and stay longer at the first SECTORS of the parading avenue. This is so because parades are unique moments and their spontaneity cannot be predicted. Therefore, the audience seating at the beginning and the middle of the grounds usually attend School's performance for a longer stretch of time than expected. In addition, when a School reaches half of its parading time, the next School to parade starts warming up in front of SECTOR 1. SECTOR 1 is off-the grounds, but it's visible and audible to the lower-numbered SECTORS. In other words, the lower-numbered SECTORS are more entertained than the higher-numbered SECTORS because they have a shorter time-lapse between Schools. So keep this information in mind when choosing your location along the parading avenue in the Sambadrome. 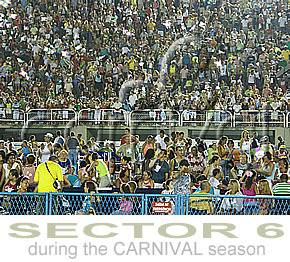 Next, we present the SECTORS and all the seating distribution along the Sambadrome. For more details about the four kinds of seats offered in the various SECTORS, check our next section, choosing the seats. IF YOU HAVE BEEN RE-DIRECTED TO THIS DIAGRAM WHILE READING ANOTHER TEXT, return to keeping an eye on the time-lapse between performances or click on the blocks of the diagram to return to their respective explanation. Thirteen of these seating blocks accommodate the great majority of the audience and are known as SECTORS. 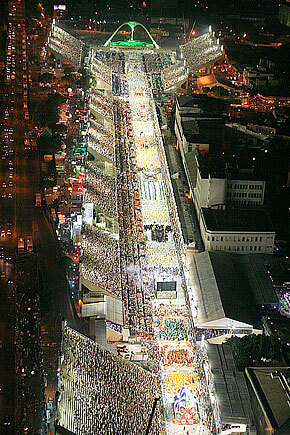 Parades start in front of SECTORS 2-3 and finish at the Apotheosis Square (Praça da Apoteose) in front of SECTORS 12 and 13. Odd numbered SECTORS are placed on one side of the avenue facing the even-numbered ones on the opposite side. Ten among the 13 SECTORS conform to this model: SECTORS 2 to 11, as you can see in the PARADING DIAGRAM. 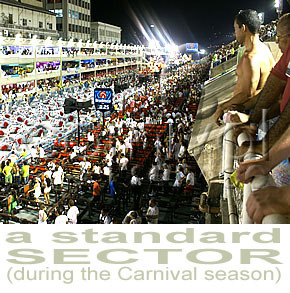 Standard SECTORS are spread along the parading avenue and offer great views. 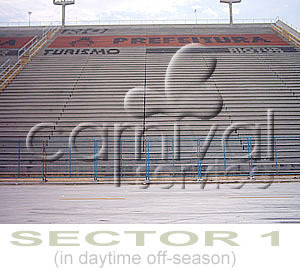 SECTOR 1 consists of a single grandstand structure, rising up to 15,80 meters. 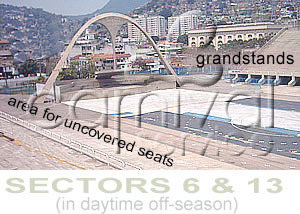 It's the highest of all SECTORS and only holds one kind of seat, the bleachers themselves (the concrete-made platforms). Schools concentrate in front of SECTOR 1 to warm up their percussions before parading start: a very special moment! SECTORS 12 and 13 are placed at the end of the parading avenue, very close to theApotheosis Square (Praça da Apoteose), as shown in the parading diagram. They differ from the standard sectors because they don't have covered seats, only grandstands and uncovered front seats (back stalls and open boxes). As mentioned above, there are 21 seating blocks made of concrete alongside the avenue, 13 of which are known as SECTORS. The 8 remaining seating blocks are located between odd numbered sectors, four by each side, as you can check in the parading diagram. 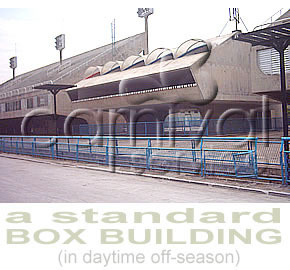 They consist of smaller buildings holding exclusively one type of seats: large boxes. These buildings are not considered sectors as such, because of their size, and were not even designed originally to hold spectators. We refer to them as BOX BUILDINGS. In Brazilian Portuguese they are called CAMAROTES ESPECIAIS. Their numbering is simple. Each BOX BUILDING gets the lowest of the SECTORS numbers that surround it plus letters "A-B". These letters stand for the 2 types of large boxes available in BOX BUILDINGS, namely Large Box Type A and Large Box Type B. For example, BOX BUILDING 5 AB - or, if you want to practice your Portuguese, CAMAROTES ESPECIAIS 5 AB - is located between sectors 5 and 7, as you can check in the parading diagram. Want to say it all in Portuguese? Give it a try! As mentioned above, parades begin in front of SECTORS 2-3 and finish at SECTORS 12 and 13, next to the Apotheosis Square. As Schools advance along the avenue they display different aspects of their performances. 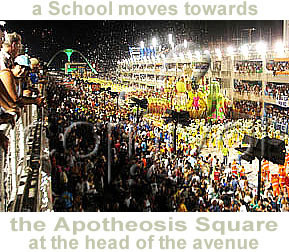 In addition, SECTORS tend to experience longer time-lapses between parading Schools the closer they are to the Apotheosis Square. Next you'll see our rating of the different SECTORS. SECTOR 1 Certainly one of the most exhilarating sectors: after all, it's where schools gather to concentrate their energies before the parades actually start. Unfortunately seats are not for sale here: they are reserved to the members of the Schools communities. SECTOR 9 (TOURIST SECTOR) Also known as the tourist sector. Offers the same advantages of sectors 5 and 7 plus exclusive services for tourists, such as bilingual guides and a RIOTUR office. Privileged location close to the "recuo da bateria", the percussion gathering area. A very good location. SECTOR 8 and BULDING 8AB In front of sector 9 (the tourist sector), which is considered the best sector in Sambadrome, sector 8 has a privileged and frontal view to "recuo da bateria", the percussion gathering area. Also a very good spot. SECTORS 4, 5, 6 and 7; BOX BUILDINGS 4AB, 5AB, 6AB and 7AB Central location: from these sectors you have a broad view of the parading avenue. You witness both the beginning and the middle of the parades. Certainly a great spot. 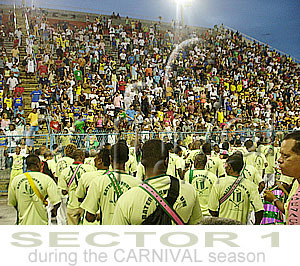 SECTOR 11 Like sector 9, it's close to the "recuo da bateria", the percussion gathering area. It's closer to the ending of the parading. SECTOR 10 In front of sector 11 and although this one also has a privileged view of the "recuo da bateria" (the percussion gathering area), this is the most popular of the sectors we sell tickets for, due to they being the cheapest tickets available. 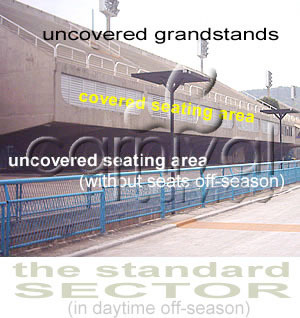 SECTORS 12 AND 13 Uneven: limited view on the higher levels of the grandstands but reasonable on the lower seats. At the end of the parades. Now that you have enough information about the locations of the different seating areas, it's finally time to know about the choice of SEATS.